Good morning! This is my final card for the Anni-VERVE-sary sketch challenge last week. I used Julee's sketch, AVS205. 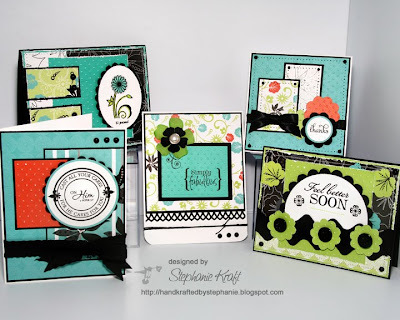 I continued the use of the Black Orchid patterned paper and incorporated the Swiss Dots embossing folder in all 5 cards (see below for a photo of all 5 cards). Each card was finished off with black pearls. Accessories: Swiss Dots embossing folder, Flower dies, Cuttlebug (Provo Craft); Ribbon, Pearls (Kaisercraft), Paper Piercer, Bow Easy, Foam Booster. such a gorgeous set of cards! So pretty! Its such a lovely set!